Last weekend Boomgaardstraat was buzzing from the traffic of wheelies. But that was not all. 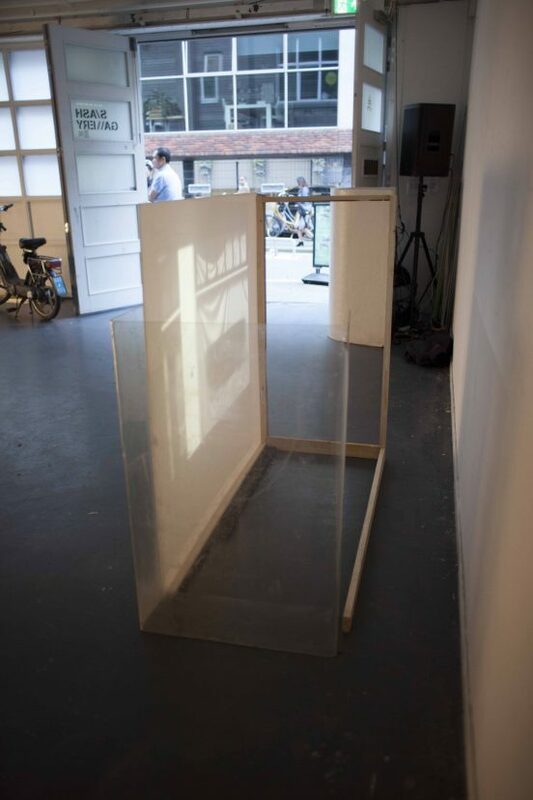 Alongside her second edition of Wheelie Parade, Philippa Driest also presented her collaborative exhibition, “Viewpoints” together with artist Hedvig Koertz. 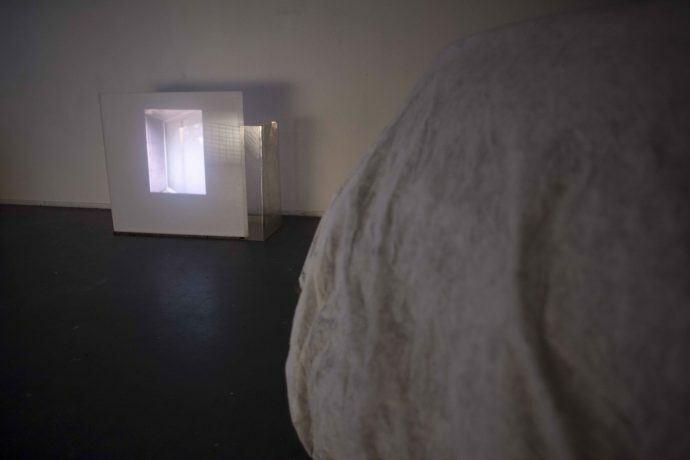 In Slash Gallery, the two artists projected their installations onto unconventional materials. The inspiration behind this collaboration was façades of buildings, and their work examined the notions of introversion and angles of perception within architecture. Hedvig, what is the concept behind Introverts’ Façade? – I have a growing collection of photos I’ve taken of window facades in different cities; when I look at these photos, I notice that the window façade functions as a strange tableau, which is a result of the tension between ‘inside’ and ‘outside’. When we speak of a façade, it’s usually associated with something representative, something you’d like to display or a certain way you’d like to be seen by others. I think it’s an intriguing question to ask, starting off with these photos; what would be an ‘introvert façade’? A façade that doesn’t want to present itself, that wants to hide and avoids ‘eye contact’ with the passer-by? Philippa, how did you come up with the idea of projecting on a car? – Driest: The research we are doing on ‘viewpoints’ has to do with how we perceive the city from different angles. The video work, ‘On the Lookout’ is shot while moving in different ways through the city: riding a bike, on the back of a moped and driving in the car. 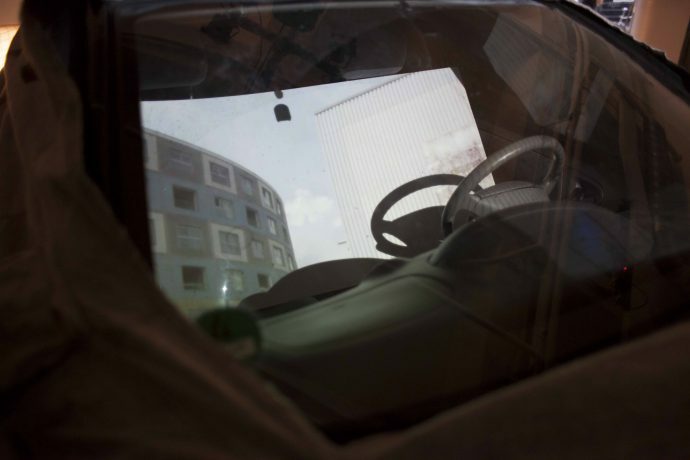 The covered car became an important object in the installation, where it functions as the pedestal for the story of the onlooker, furthermore as a hiding spot to be on the lookout. What materials do you love working with the most? – Koertz: I work in a range of materials, I like to work with the play between things that are recognizable and ones that are less easy to grasp. 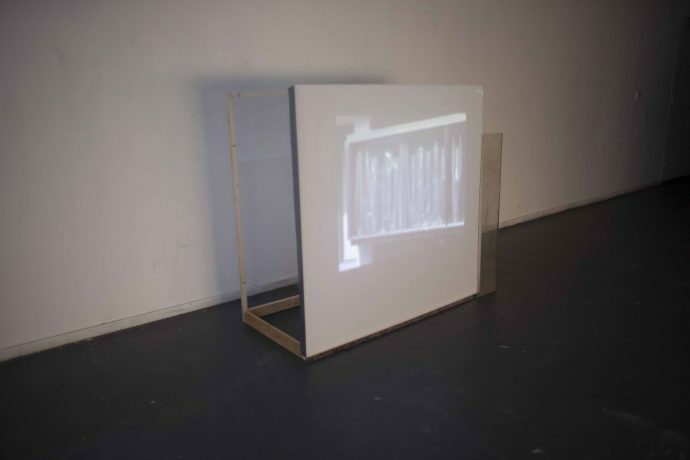 For this work, I used cheap wood to build a structure which is a holder for the screen but also creates a sort of space behind it along with a transparent, very worn plastic screen of uncertain origin. I really like the sleekness of the Perspex screen and how it blurs the projection in combination with these rougher and slightly awkward gestures. – Driest: I don’t necessarily have a favourite tool or material I like working with. It really depends on the topic or vibe you are working with. There are some preferences when it comes to deciding which material to use. Always steel over wood. What attracts you in architecture? – Driest: I think it’s interesting how most of the architecture is decided upon before it is even constructed. The architect is positioned within a fictive reality, while we believe the architect to be present or at least react to the real matter. Another aspect that I find interesting is the spatial narrative. Once a building is constructed, space starts showing its social and psychological narratives when we move in different sequences through a building. – Koertz: I mainly focus on interior spaces but I think the impact of architecture and how it determines how people move, what they experience and how they interact is crucial. So that’s the actual part of the same point as Philippa elaborated in her answer. – Koertz: My favourite window façade is in Davidsstraat. My favourite building is probably the Maastunnel – also as a super interesting example of the play between the experience of façade and the interior space. – Driest: De Peperklip from Carel Weeber, situated in the South of Rotterdam. How does ‘viewpoints’; reflect your personality as artists? – Driest: Uh, I don’t know if it reflects my personality. Maybe it reflects my behaviour more. I often stroll around the city finding new spots, buildings, and communities. – Koertz: I think I miss more space in life (and in the art) to be introvert and not have to deliver or show yourself from your best or most precise point. That reflection comes is connected to me personally/ to my way of being in the world. – Driest: This weekend is the final stage of the research project Rotterdam Cultural Histories #13: The Temporary Autonomous Bureau in TENT. With a temporary collective, I researched and discussed interpretations of autonomy in cultural or social projects within Rotterdam. Alongside that, I’m working on a project where I try to lay bare the friction between policy makers and inhabitants of a neighbourhood. 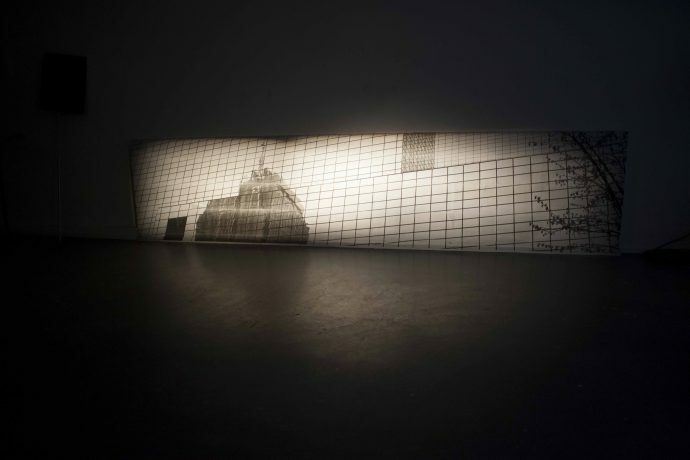 – Koertz: I am going to study at the MIARD (Master Interior Architecture) at Piet Zwart here in Rotterdam and hopefully extend my knowledge about architecture and its role within my work. In July I am taking part in an exhibition in Aarhus, Denmark where my friend Jakob Ehrlich and I will collaborate in making a site-specific installation in an old museum.